Recent renovations to the Stern Center basement have left students with a beautiful, Japanese style lounge. 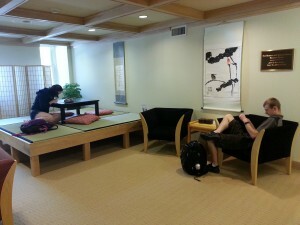 The lounge features elements of feng shui, and contains tatami floor mats, an elevated seating platform, a stone fountain, the game GO!, and an expansive six panel painted screen, depicting an old Japanese tale. In her much-praised The Vase Project Professor Diduk asked one hundred local Jingdezhen artists to each paint one white porcelain vase. Each artist was given a blank vase and asked to respond to the preceding artist painter’s vase. They were asked to interpret the vase imagery, incorporating their own individual painting styles in the pieces, but not to copy it, since mimetic copying is the usual painting method practiced. The first painter in the Project responded to a small drawing that incorporated kiln stacks along with the always familiar historical landscape image. In this case the inclusion of manufacturing was intended to reflect the current contemporary scenic landscape in Jingdezhen today. Taken as a kind of ceramic quilt or kaleidoscope, the vases help viewers see what the city was like before and during modern industrialization and the process whereby artists shifted their attention from imperial and scholar-elite or merchant patrons as customers to hotel chains in need of crockery, foreign tourists in search of China’s past, and Chinese consumers trying to keep up-to-date in a rapidly changing material culture. As her collaborative project demonstrates the ongoing evolution of the city in its environmental policies (switching from coal-fired to propone kilns for example) proves, there is a forward-leaning outlook among Jingdezhen artists, activists and ordinary residents even as the community struggles to preserve Jingdezhen’s artistic legacies. The city that produced The Vase Project is in the throes of transitioning from a rugged, dirty, small manufacturing center consisting of workshops and smallish factories, into up-to-date manufacturing facilities and a center of modern ceramic art. The waning of ceramic making traditions in Jingdezhen is best understood both in global context (this is not the first time that craft traditions have been reshaped by new markets, technologies and artistic sensibilities and health and environmental concerns) and the local realities that contribute to such powerful turns of history in unique, culturally colored and inflected forms. In the summer of 2015, a group of students will travel to Jingdezhen on a study-trip, which will provide even more critical insight into the culture surrounding ceramics in Jingdezhen.